Although many unanswered questions remain, in this month’s edition of Business Insights, we attempt to recap recent Chinese actions with regard to recycled commodities and examine some of the issues going forward. In the second half of July, the Chinese government filed a notification with the World Trade Organization (WTO) proposing to ban the import of 24 solid waste materials, including certain types of plastic and unsorted waste paper. In late August, the Chinese government then went on to say it would impose a 0.3 percent contamination standard on bales, and both actions were slated to take effect by the end of 2017. The Chinese rationale for the ban and contamination limit was to stop “foreign garbage” from inundating China—the moves were characterized as environmentally driven. Initially, although industry groups (ISRI, SWANA and NWRA) raised the alarm and protested to the WTO and Chinese authorities, the publicly-traded companies were more sanguine (at least on the second quarter conference calls), noting that they already produce higher quality bales or already sort waste paper, while also emphasizing that the Chinese paper mills need the quality fiber that the US produces for feedstock. Several industry participants also pointed out that the U.S. recycling industry has seen similar moves from China in the past, with the intent to drive down recycled fiber prices. That indeed did come to pass in early October, when the pricing on recycled paper grades, even OCC, nosedived. However, that was largely blamed on the fact that import licenses from China had not been renewed (none had been issued since May), rather than the ban per se, which essentially choked off the flow of recycled commodities to China. 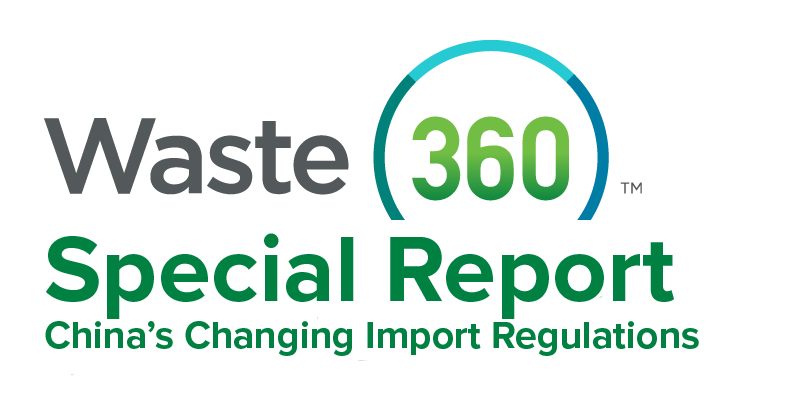 The entire fiber recycling market was impacted by the early October price drops as reported by RISI—export OCC pricing to China fell over $70 per ton on average, while domestic OCC fell $55 per ton on average, and mixed paper fell slightly over $30 per ton. China took in roughly 25 percent of US recycled paper exports in 2016 and anywhere between 20 percent and 33 percent of recycled plastic, depending on the type of plastic. ISRI put the total scrap export market to China at $5.6 billion last year. Off the West Coast ports, recyclables export (mostly to China) is 24 percent of the total--the biggest single export! That factor, combined with the high diversion rates on the West Coast, has put a number of states and localities in a bind. Of particular note is Oregon. Oregon in general, and the city of Portland in particular, have high diversion rates (in part due to the use of single stream systems as well as cultural desire to recycle), but collection contamination rates can range around 20 percent-25 percent. The West Coast recycling industry’s reliance on exporting its recyclables to China, combined with higher levels of contamination (even after processing) has caused recycled commodities to stockpile at some facilities, and a number of players and municipalities have asked the Oregon DEQ for waivers to landfill them as a result. The Midwestern OCC price move ($40 per ton) was much more muted than the coastal export swings, and the publicly-traded companies (and others) who had diversified their export markets to India and Southeast Asia or were able to ship higher quality bales domestically took a price hit, but were able to move their recyclables and not landfill them. Although single stream is probably here to stay, given its inherent volume advantages and ease of use for consumers, the relentless drive for higher diversion rates (at least on a weight basis) will likely have to be questioned, given the new Chinese contamination restrictions. After a short period of speculation that the contamination standard would be eased to 1 percent from 0.3 percent, the Chinese came out in mid-November with their official new standard of 0.5 percent, now to go into effect in March of 2018. This raised another round of consternation, because if strictly enforced (still a big IF), it is basically unattainable for processors currently, especially in that time frame. Typical bale contamination rates for modern material recovery facilities (MRFs) are between 2 percent-4 percent, while the thinking was that maybe 1 percent was reachable with more labor and more advanced sorting technology. The newest wrinkle is the new import licensing requirements. Also in mid-November, the Chinese put out a public notice to the effect that to receive an import license in the future a paper mill must produce 300,000 metric tons annually. All other smaller mills will be required to source domestically in China, though the Chinese recycling infrastructure is considerably smaller than that of the US and far less developed. It is officially estimated that only 2 percent-3 percent of Chinese waste is recycled, though that likely significantly underestimates the impact of small scrap collectors, or scavengers. If they are included, the recycling rate may be closer to 30 percent. It looks increasingly apparent (editor’s opinion) that China is moving back toward more communist control and away from some of the free market capitalist reforms that had been undertaken under the previous Chinese administration, based on the rhetoric that came out of the National Congress of the Communist Party in October that solidified President Xi Jinping’s power. The recycled commodity actions, emphasizing pollution control and the favoring of larger mills, is just a microcosm of what is happening across the Chinese economy. The National Congress speeches made clear that while there is greater emphasis on controlling pollution, China also wants to support and bolster its state-owned enterprises. This dovetails nicely with China’s desire to improve its domestic recycling market and become less reliant on imports. At the ISWA World/SWANA WASTECON conference in September, the Chinese government official talked about raising the recycling rate by 5 percent, or more than 40 percent in terms of tonnage, by 2020 from 2015 levels. It has been estimated that the new import license requirements (300,000 minimum annual metric tons) would limit recipients to only a handful of mills. By requiring the smaller mills to source domestically, the Chinese government kills two birds with one stone—it will both raise the domestic recycling rate and foster the accompanying infrastructure, as well as force capacity out of the paper market, as a number of the smaller mills will be forced to shut down—solidifying greater market share and power in the handful of larger mills. Back stateside, even if the new Chinese proclamations are eased in reality, several possibilities could occur—there could be a bifurcated market, particularly in paper, where the higher quality material (primarily OCC) can be exported but lower quality bales will remain in the domestic market, presumably at lower prices. Many recycling advocates hope that this will force more domestic recycled product markets to develop, but this will take time. In the meantime, and near term, size and financial resources will become an even greater advantage. First, those able and with the resources and contacts to diversify away from Chinese markets will be less impacted, and a number of Southeast Asia markets and the India market are expected to grow as a result. Secondly, improving the quality of the bale will likely continue to be of huge importance, however the ultimate proclamations pan out. Thus, those who have the resources to throw more labor at the line, as well as to invest in more advanced sorting and robotics technologies, will also have an inherent advantage.